Applications are Invited from the residence of Morigaon District alongwith two numbers of passport size photograph and self addressed stamped envelope for selection of 50 numbers of PLVs. 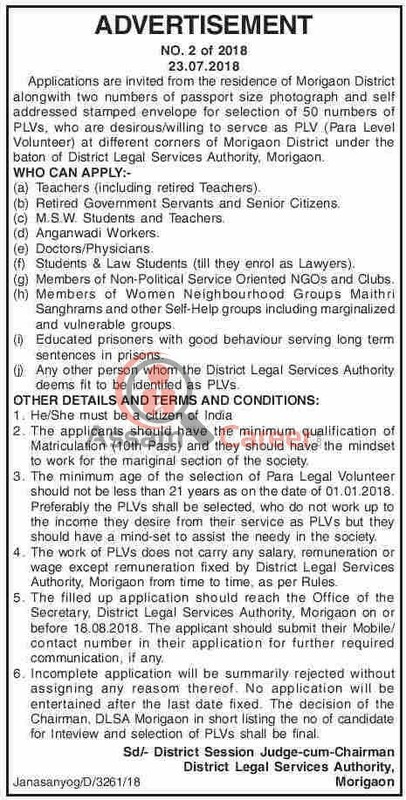 who are desirous/willing to serve as PLV (Para Level Volunteer) at different corners of Morigaon District under the baton of District Legal Services Authority, Morigaon. Educational Qualification: The applicants should have the minimum qualification of Matriculation (10th Pass) and they should have the mindset to work for the mariginal section of the society. Age: The minimum age of the selection of Para Legal Volunteer should not be less than 21 years as on the date of 01.01.2018. Preferably the PLVs shall be seletted, who do not work up to the income they desire frorn their service as PLVs but they should have a mind-set to assist the needy In the society. How to apply: The filled up application should reach the Office of the Secretary, District Legal Services Authority, Morigaon on or before 18.08.2018. The applicant should submit their Mobile/ contact number in their application for further required communication, if any. 6. Incomplete application will be summarily rejected without assigning any reason thereof. No application will be entertained after the last date fixed. The decision of the Chairman, DLSA Morigaon In shortlisting the no of candidate for interview and selection of PLVs shall be final.